It has been interesting to watch the discussion over the last week on Ridecamp about the barefoot hoof and protective horse boots. The tone of the discussion has really changed since the last time – there is a heightened sense of community, willingness to help and willingness to listen. It sure helps that the number of tryers has increased so dramatically. It is perceived less as an activity for the marginal participants who have special circumstances, special needs or special powers. Steph and John Teeter’s horses Rhett and Sunny this weekend riding in Easyboot Gloves. I’ve been getting lots of emails over the past few months about how to start the transition. My recommendations are always the same. If you take short-cuts, you may not enjoy as much success as from a methodical approach. Get a hoof care professional to pull the shoes and trim the feet. Use a professional trained in barefoot trimming methods if you can. A pasture trim is not the same as a barefoot trim. 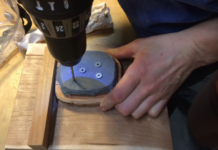 Measure the bare hooves and use those measurements to order a Fit Kit so you can try a coupe of boot sizes. Size does matter! 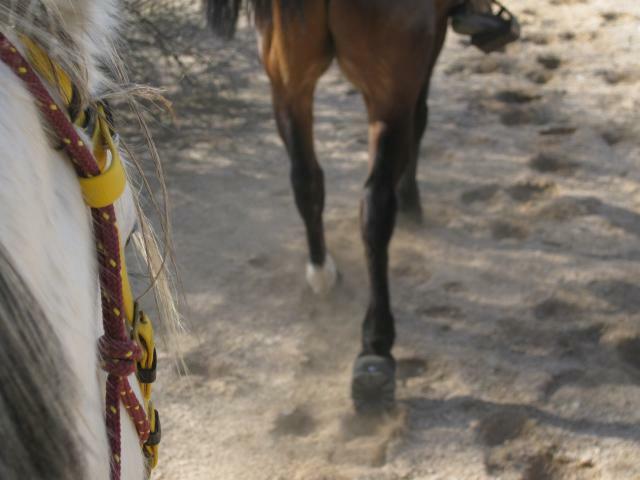 Many people subconsciously want their horse to wear a bigger boot because bigger feet are better. But a tighter fit is a better fit and you will significantly reduce the risk of having a negative boot experience. Order the size of boots you need – some horses wear different sizes on opposite sides. That’s OK! Inform yourself about application procedures on the EasyCare website. Don’t not fear: it is not as complicated as you think it is going to be. 2. How do I increase my chances for success? Do everything you can to keep your horse working and moving. Increased activity will increase blood flow through the hoof which will speed the transition process. Some horses may need to spend part of their first few barefoot weeks booted in the pasture. They may show sensitivity and boots can help them feel comfortable enough to move around which will speed up the adjustment process. Test your boots in various conditions – all four of our horses are now wearing boots without power straps. A couple of them need athletic tape on the rears for additional tooth. A little field testing with your horse will go a long way, especially if you are planning on competing in boots. Once your horse is showing signs of good foot health, pick a trail that will allow you to ride without boots completely and ride there regularly. 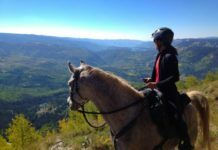 I have never competed at an endurance event without boots, but I try and ride once a week on a trail that allows me to ride completely barefoot. 3. Should I worry about thrush? Yes. Thrush is a threat no matter what the conditions you live in. Clean out the feet as often as you can – once or twice a day is not too much, but also not very realistic for most of us. Invest in some Ricken’s Foot Formula #1 or something similar. It will help eliminate the bacteria and speed up the callous process on the sole of the foot. 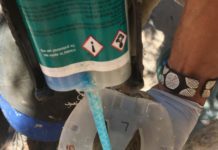 Apply it often – especially in the beginning – but make it part of your weekly routine for maintenance. 4. How often should I have the feet trimmed? It depends on the horse and the amount of work. We are on a five week schedule at my place, but I’ve found it beneficial to do a little maintenance of my own once a week on the working horses. I do very little except maintain a good mustang roll and keep the pressure of the quarters. Invest in a hoofjack and rasp. 5. Do I really have to worry about diet, too? Every horse will respond differently to being barefoot. But you should inform yourself about how diet can affect the health of your horse’s feet. The long and the short of it at my place is to avoid grain and grain hays. That means we feed mostly Bermuda; and we almost never feed grain. Our horses get a low starch feed with some rinsed beet pulp and a performance vitamin twice a day. We try and free-feed them their hay. There is some great info at safergrass.org. 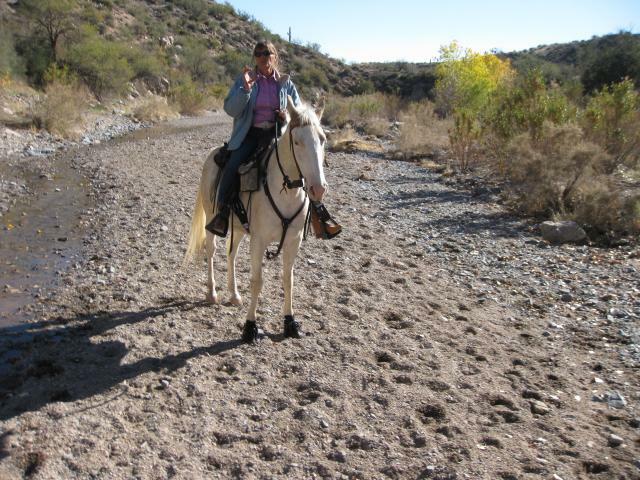 We came across this trail rider at Camp Creek last weekend riding in Boa Horse Boots. Kyle Nielsen from Maine riding Redford. Keep up the bootlegging and let me know how it goes for you! 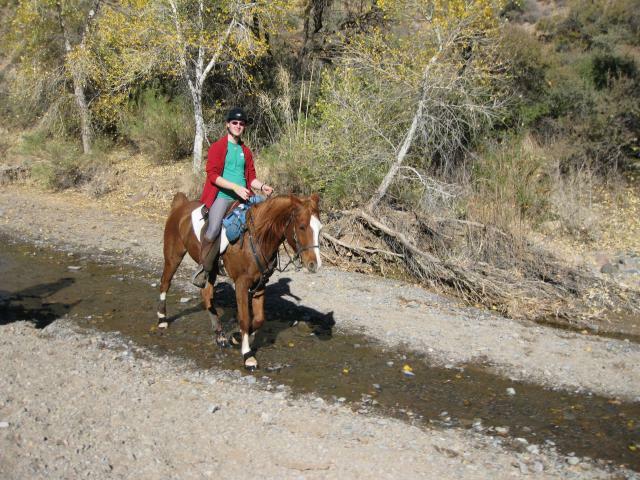 Previous articleAnother Success Story From the Warner Springs Endurance Ride! Next articleWhat did Easyboots accomplish in 2009?